Jeff is a REALTOR® with Coldwell Banker Residential Brokerage and was voted Best Real Estate Agent of 2018 by readers of the Free Times. As your agent, he will communicate and be there for you through every step of the process. As a first time home buyer, he can provide a wealth of knowledge that will help you make the best decisions about buying a home. If you are selling your home, then he can assist you with pre-listing advice in preparing your home for sale. With a strong marketing background, you leave nothing to chance by selecting Jeff to list your home and Coldwell Banker as the brokerage of choice. Just leave it to Lawler! 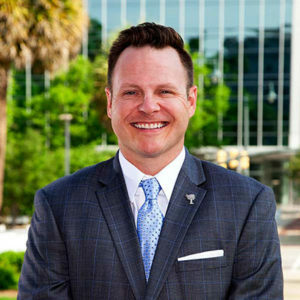 Jeff is a graduate of Spring Valley High School and a College of Charleston alumnus where he earned his degree in corporate communication. While at the college, he served as a delegate in the South Carolina Student Legislature for two years and also served as president of the Kappa Alpha Order. As a Columbia native, he believes in the immense opportunities the Midlands and its community has to offer. Jeff is very passionate about the community; supporting and volunteering with many different nonprofit organizations. He was honored to serve as the Chairman of Columbia Opportunity Resource (COR) in 2014 and 2018, and continues to serve on its executive committee. As an avid supporter of the preservation of Columbia’s history, Jeff serves on the Historic Columbia Advisory Council and its strategic planning committee. Jeff is also a graduate of the Leadership Columbia 2012 class. In 2017, Jeff served as the education chair for the Sales & Marketing Council of the Building Industry Association and also was selected to the inaugural class of Richland Library’s Do Good Columbia program, an initiative focusing on increasing access and usage of Columbia’s river system. In 2018, he joined the Columbia Rotary Club and was also selected as membership chair of the American Advertising Federation of the Midlands.